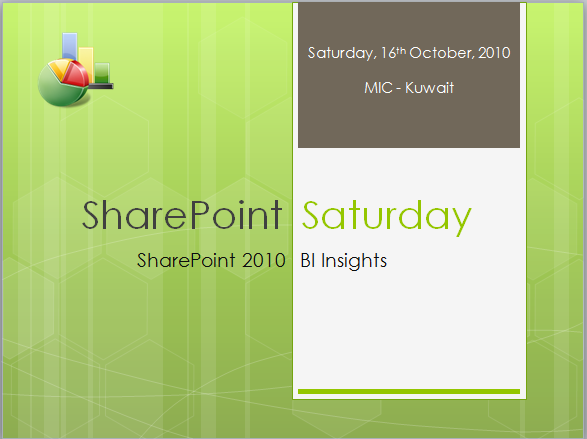 Thanks a lot for everyone honored us by being there in the SharePoint Saturday event 16th October 2010. Windows Server 2008 evaluation from here. SQL Server 2008 R2 evaluation from here. Office Professional Plus 2010 evaluation from here, this one only works for 60 days unfortunately . SharePoint designer 2010 from here, this one is free . Download the SQL Server 2008 R2 AdventureWorks sample database from here. Download PowerPivot for SharePoint and excel from here, this one is free . Follow the following guide to have SharePoint 2010 installed here. When you been asked to create a site collection, create one using the Business Intelligence Center Template. Install the SQL Server 2008 R2 AdventureWorks sample database executable. Follow this guide to install the analysis services database. Install Office Professional Plus 2010. Install PowerPivot fro excel ( the download page has a small guide for that). Install PowerPivot for SharePoint using this guide. Configure Excel Services using this guide. Add the Data Connection Library on your BI Center to the trusted data connection libraries on the Excel Services manage page. Configure the unattended service account for PerformancePoint Services using this guide. To be able to open Office files from SharePoint without annoying unknown errors enable the Desktop Experience Feature using the following guide. Now, you have the presentation and lap machine up and running. Kindly, note that additional configuration steps will be added within their related demos, as the above setup is the basic one. Please, try to create the machine and let me know if you need any help. ISA in the following posts, I’ll create samples using the above created machine on the different tools of the Microsoft BI framework.